Well.... I finally finished it and it's in time to enter it in Colored Pencil Society of America Exhibition. Yayyyyyy!!! This piece is done with 100% Colored Pencil on Pastelmat Card, it's 16" x 20" and the title is, "Spirit Animals - Alpha Pair". 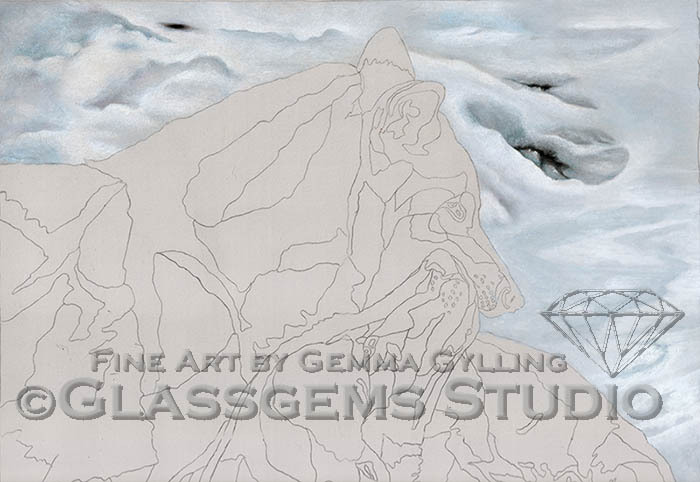 It was created from a photo I took while observing a pack of wolves, while in Montana. 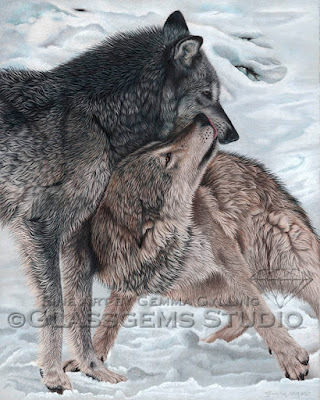 I really enjoyed watching the interaction amongst wolves and especially the Alpha Pair. The interesting thing is the male is the one who is cowering down to the female. I took several photos of the pack so I hope to do some more of them in the near future. If you have any comments or questions don't hesitate to speak up. Here's my next update. 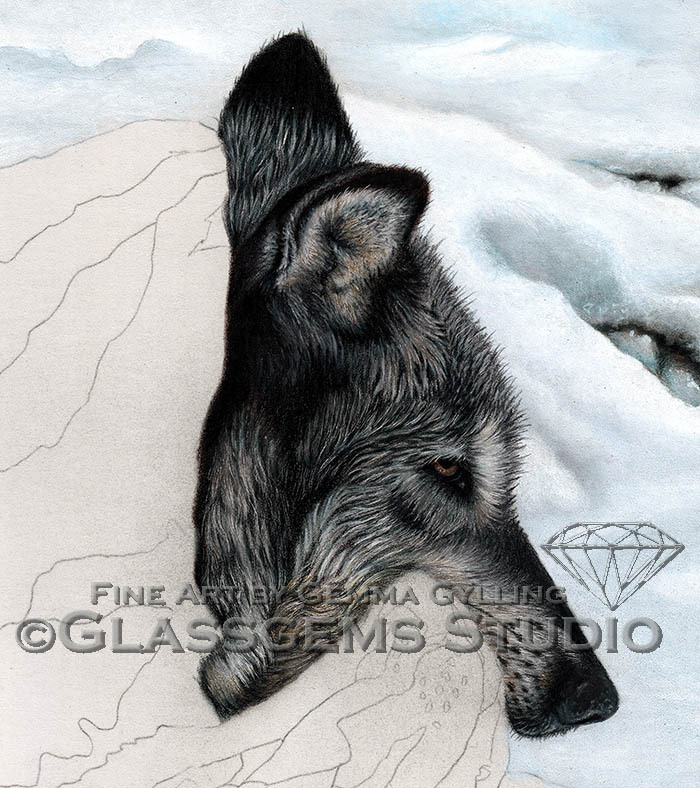 I got the black wolf done but I can see some tweaks I need to do. 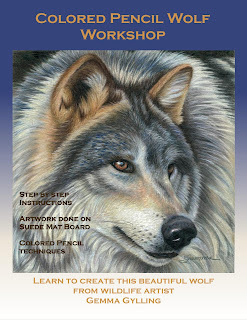 I'm now going to move over to the male wolf's body. I absolutely have to get this done by the end of the month, this is one of my entries for the Colored Pencil Society of America Exhibition. It sure seems as if I've gotten a ton of interruptions this past couple of months but I think I can really dedicate some time this month to finish it. I think I can.... I think I can.... I think I can.... LOL! 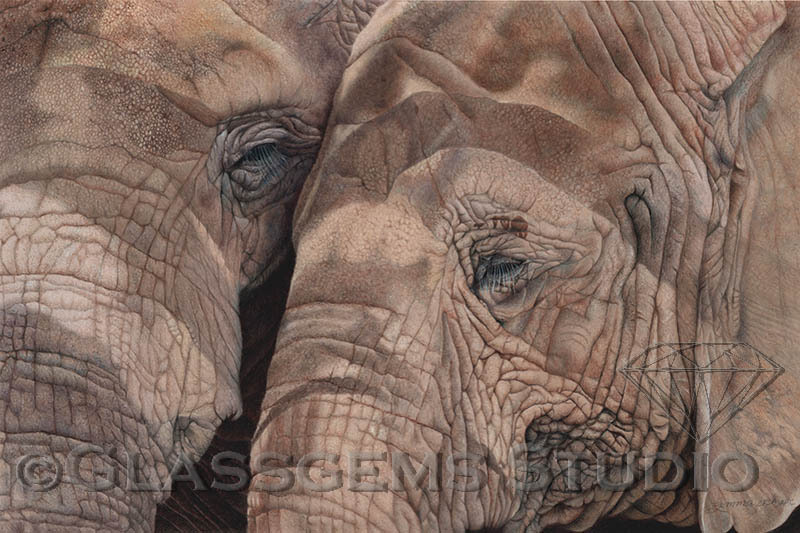 This piece is done with 100% colored pencil on pastelmat card and is 20" x 16". 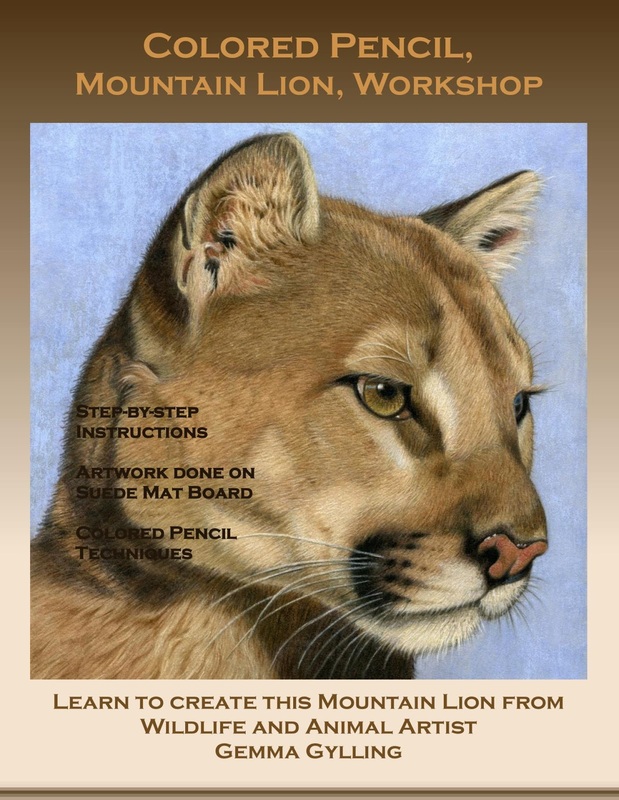 It's done from a photo I took while in Montana in January of 2018. If you have any questions or comments let me know. 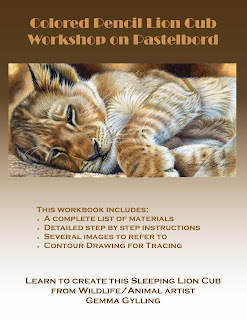 Good news... 4 of my workshop books are now available on Amazon as a Kindle ebook. For those of you who don't have a kindle you can still view it with a Kindle App on your devices. 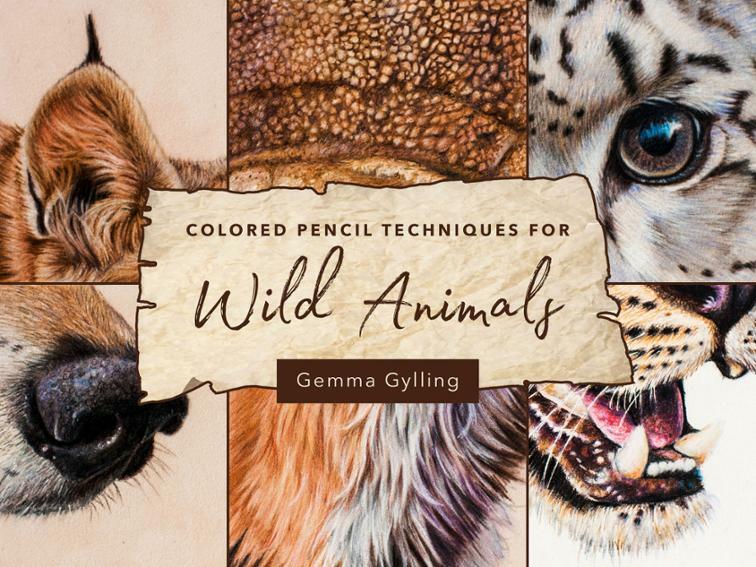 You can just search for Gemma Gylling, on Amazon and you will see the books that are now available. I also have them available, as softcover book, on my website, the projects that require suede mat board will have a piece of suede mat board included, go to My Website. 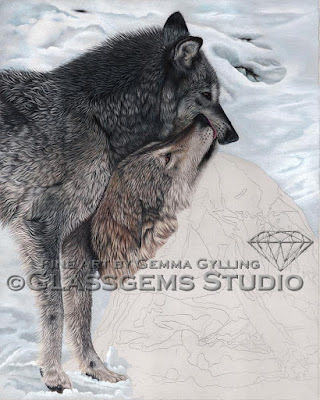 Here's the next update to my Alpha Pair drawing. It's going slow, because I have been soooo busy. Hopefully after this week I can spend a lot more time on it. 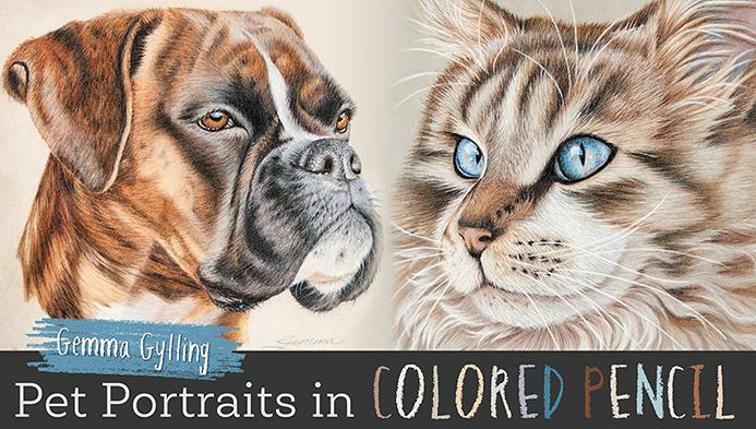 This piece is done with Colored Pencils on white, Clairefontaine Pastelmat and it's 20" x 16". 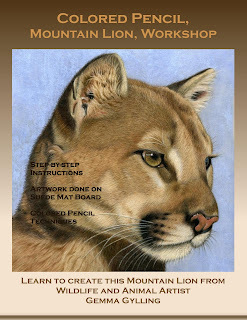 It's created from a photo that I took while in Montana at Triple D Wildlife. 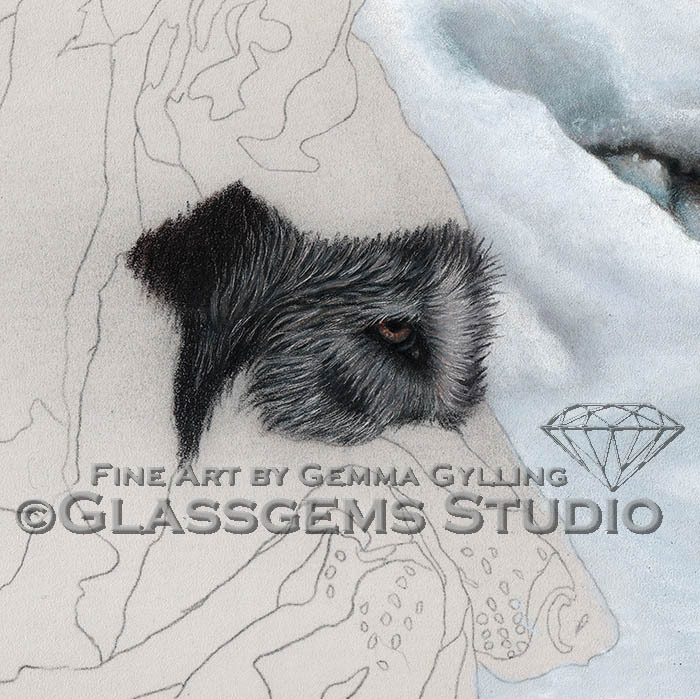 This is just a portion of the entire piece, the composition when finished will look like the reference photo crop. An image of the reference photo is below. This pair of wolves were the alpha pair of a pack of wolves I was photographing. I was so interested in the interaction between the two... it was so much fun watching them and photographing them. 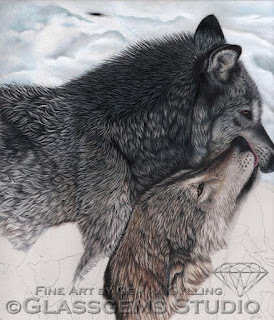 I did decide on a title, I'm going to call it "Spirit Animals - The Alpha Pair". 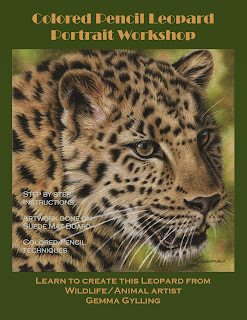 If you should have any questions or comments please let me know. Good News! 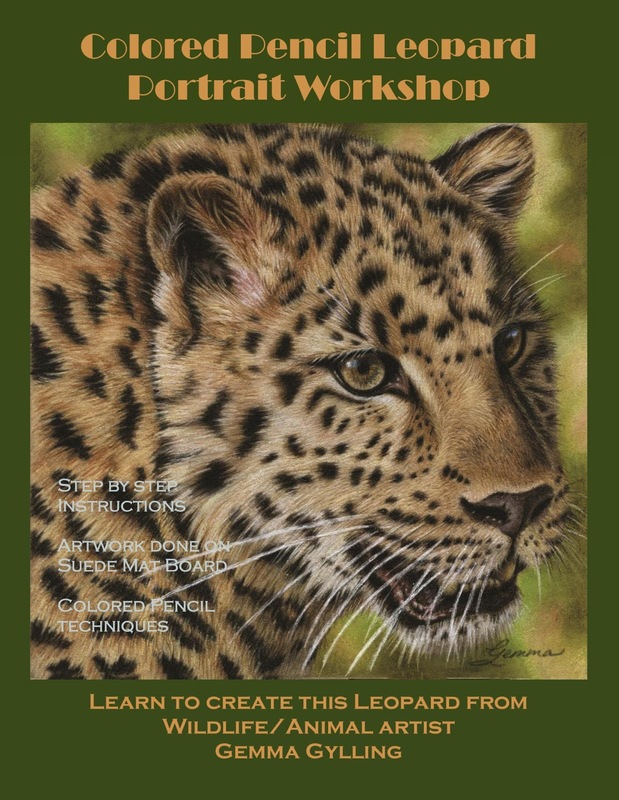 I'm going to be teaching a workshop in Cedar Rapids, IA, June 29-30, 2019. Hello again, here is the last two updates for now. See original post, Alpha Pair - WIP01, for reference photo and details. Here is the next three updates to the Alpha Pair of Wolves, I'm still trying to come up with a good title. 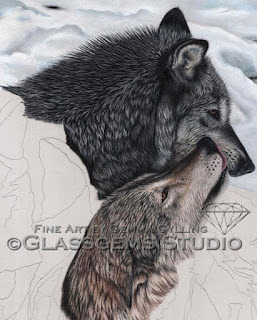 This piece is being done on Clairefontaine Pastelmat Card, it's 100% colored pencil and the size is 20" x 16". Well, well, well.... it's been forever since I posted here. There really isn't any excuse but I just thought I would mention, I was having a big problem with my website. I had to redesign it and it took two times, redesigning before I finally decided to change hosts and go for complete new software to do it. Then I had to start all over again and there was a huge learning curve. So.... between that, joining the SOAR with Ann, program, teaching workshops and lots more, I just haven't been here. So sorry! I'll try to catch up on some of my comings and goings but for now I thought I would show you my newest piece I'm working on. The top image is the photo I'm working from. I took this photo while in Montana at Triple D, in the snow, last January. While I was there I was taking a photography workshop with Kathleen Reeder (at kathleenreader.com), I highly recommend her workshops she's the one who I went with for another photography workshop to Africa. I'll try to post some images, later, that I took while there. That's another whole new story I have to get caught up on. The next image is where I started, creating the snow in the background. As you can see, I decided to take my creative license to leave out and add a bit here and there that I thought would enhance the overall composition. 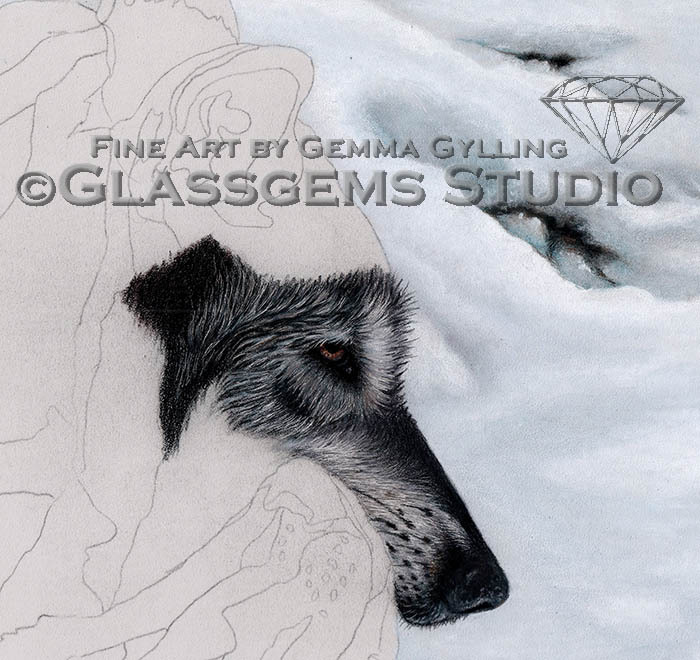 Then I started working on the female wolf, she is the black wolf. As you can see, I have just posted the progress as I continue along so there is not much to say about it. 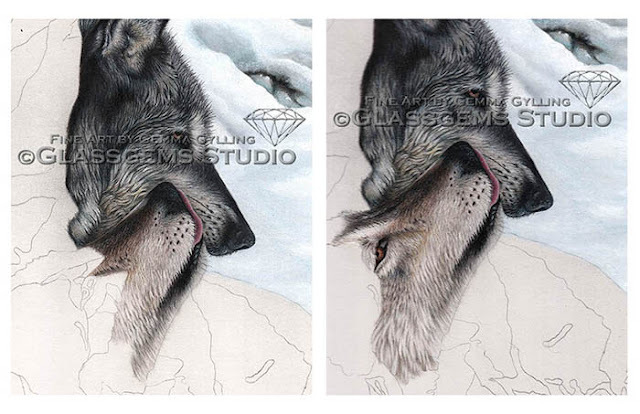 One thing I would like to mention is that it is difficult to capture the artwork the way it really is at this point because there is so much contrast between the dark wolf and the white paper, but the images will improve as I get more of the surrounding area in. 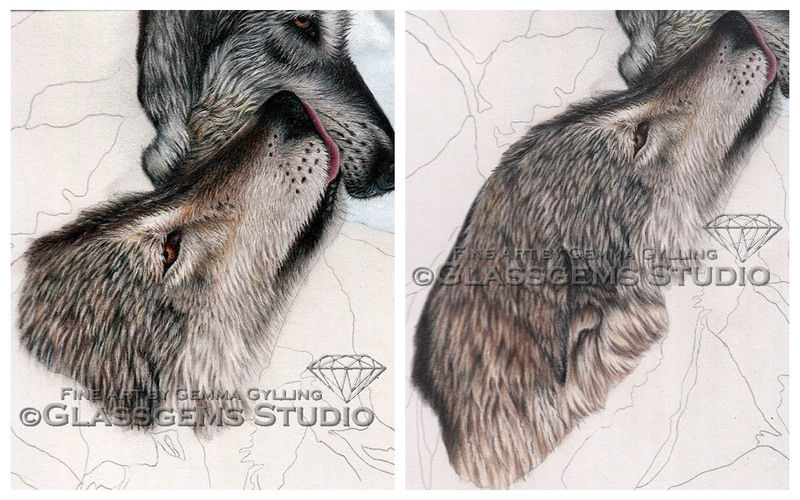 I'll be creating a few more posts because I have actually got 11 total progress shots. This piece is done with 100% colored pencil on white Clairefontaine Pastelmat Card and it's 20" x 16". If you have any comments or questions let me know. 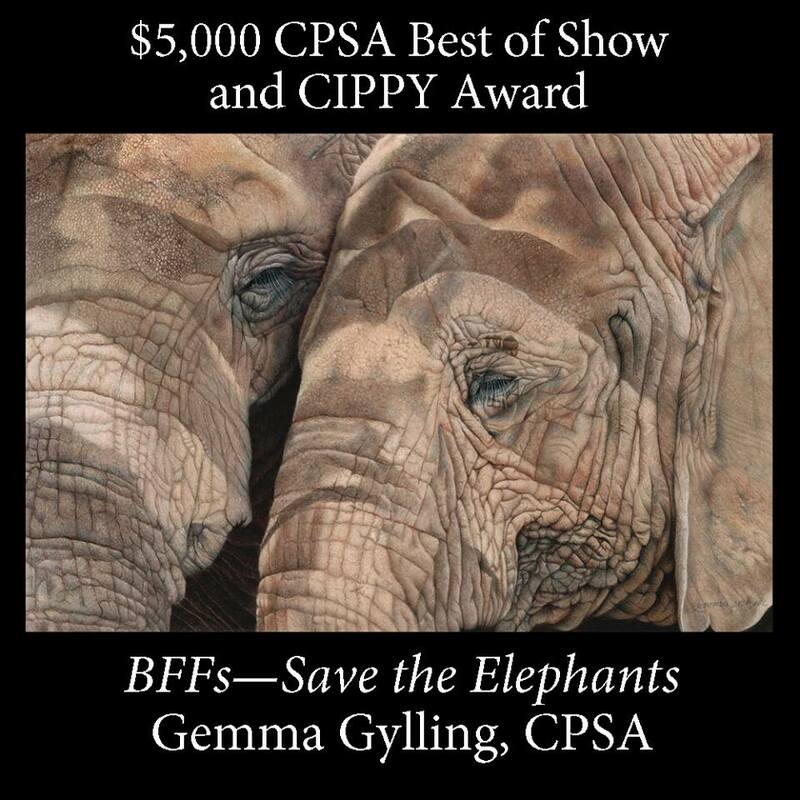 Well, I just got home from the Colored Pencil Society of America's 25th Annual Exhibition and was blown away to find out that my artwork, "BFFs - Save the Elephants" was awarded the Best of Show and Cippy award. This award has fulfilled a long-time dream and sought-after goal of mine. While on the stage and receiving the award, I went numb, started crying and just kept thinking...please... just point me in the direction I am supposed to go. Needless to say, I was absolutely thrilled!!! The one thing I would like to say to all of you is to, keep trying, keep your goals in mind and keep working at it. Don't forget to keep scribbling!! My Artwork Published in "Art Journey Animials"
I am very pleased and humbled to announce that two of my pieces of artwork are published in North Light Books new book titled, "Art Journey Animals". 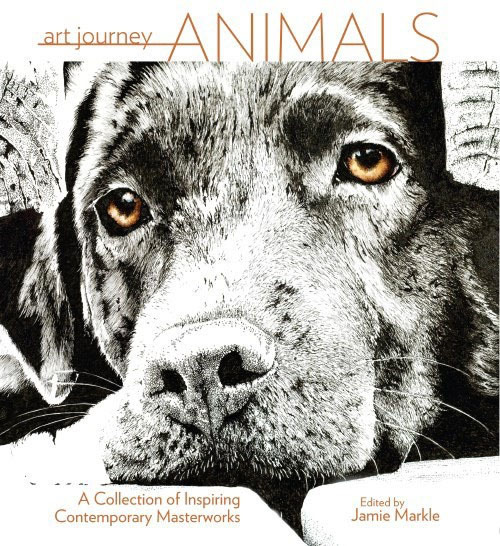 I feel so thankful and proud to see my artwork along with this wonderful collection of beautiful art, all about animals!!!! 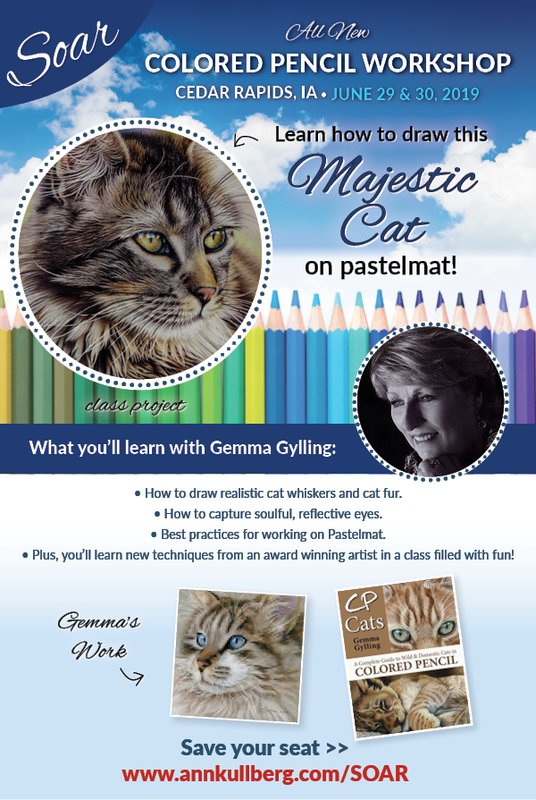 Don't forget to keep Scribbling!!! !